The '80s boom is not just restricted to toys - comics and cartoons are also getting in on the fun. While just about every property imaginable has made it back into print, the cartoon updates have been pretty sparse (probably because those require more of a financial commitment). He-Man masters his universe every week on Cartoon Network, just before the Transformers meet your eye. But that's only two of the three big properties; what's happened to GIJoe? The Real American Heroes haven't been completely decommissioned. Though they don't have a regular show, the Joe team did make a special appearance to coincide with the SpyTroops toys. He'll fight for freedom where ever there's trouble; GI Joe is there. 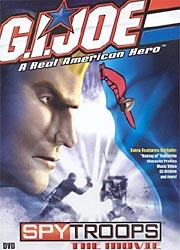 GIJoe is the codename for America's daring, highly trained special mission force. Its purpose: to defend human freedom against Cobra - a ruthless, terrorist organization determined to rule the world. He never gives up, he's always there, fighting for freedom over land and air. GIJoe - a real American hero. When the SpyTroops figures debuted, they were announced with an interconnected series of CGI commercials - the barest bones of a story ran through the ads, introducing viewers to the concept of Joe and Cobra soldiers donning large clunky armor to infiltrate their enemies. Eventually this thin story was expanded into the 44-minute SpyTroops: The Movie. A fully CGI movie, SpyTroops is intended for the same audience as the toys - which means that while Hasbro thinks that it's only for 8-to-12-year-olds, it also has a bit of appeal for us older collectors as well. The story is just as good as anything we got in those old DIC and Sunbow cartoons, if not better. As always, the cartoon is clear in its definitions of good and evil - the Joes are heroic and virtuous, while Cobra are maniacally cackling underhanded fiends. Cobra's stolen a powerful new technology from the Joes, and our guys need to get it back. Very simple story, no? Of course, but we're not looking for intense literary complexity - we want to see Snake-Eyes and Stormshadow and Cobra Commander, and that's exactly what we get. Though CGI animation has a far distance to go before it looks even half as good as its tradional cel-drawn counterpart (at least as far as humans go), SpyTroops looks much better than similar efforts like the thankfully departed Max Steele. When this film was first announced as a fully computer-animated effort, fans were quite vocally disappointed, but the final product should satisfy even the most staunch supporters of old-school cartooning. Most of our favorite characters are here: Duke, Shipwreck, Wild Bill, Snake-Eyes and Scarlett on the side of the angels, Cobra Commander, Destro, the Baroness, Stormshadow and Dr. Mindbender as the disloyal opposition. While not everyone's favorite characters appear (Where are Flint and Lady Jaye? Where are the twins, Tomax and Xamot? ), both teams are stocked with fine choices. The voice actors do a good job, even if they're not 100% faithful to the old cartoons - for instance, Beachhead was a Southern-fried badass, not a surfer dude. Still, Michael Dobson does a decent job of re-creating the poor, departed Chris Latta's distinctive lispy hiss. For a one-hour tv special birthed from simple advertisements, SpyTroops: The Movie has a surprising amount of extra features. First up is a presentation of the commercials that are the progenitors of this film, followed by a music video for "Eyes of a Hero," the movie's theme song. One-page profiles for eight Joe members and seven Cobras each feature a 3-D turnaround of the character in question. About a dozen pages of concept art are next (including one cool piece inspired by the original GIJoe comic cover), then trailers for the film (built from the commercial footage) and sets of the classic '80s series. The "Making of SpyTroops" is a good look behind the scenes that, considering that this DVD was made for kids, is much more informative than you might expect. 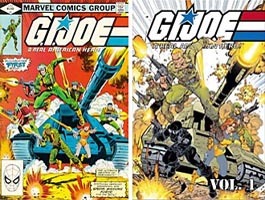 There's a preview of the mini-comics that were packaged with the SpyTroops toys, and finally a link to the GIJoe Fanclub. Originally only available in the 12" "Ninja Showdown" two-pack, SpyTroops: The Movie is finally out on its own, and definitely worth the $5 pricetag. What's your favorite toy-based movie? Tell us on our message board, the Loafing Lounge.